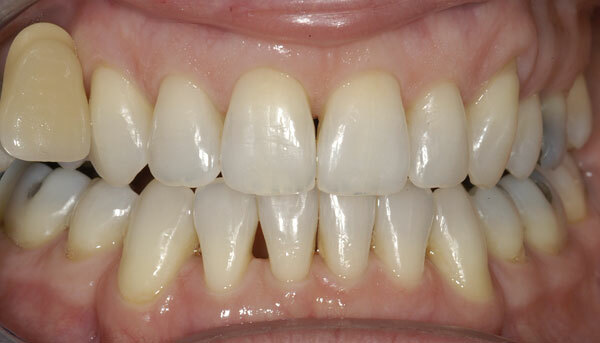 This is an example of what custom appliance whitening can accomplish. As you can see, the before photo demonstrates heavily discolored teeth. After two weeks of custom appliance whitening, much of the color has been lightened substantially. The color near the gum line at the neck of the tooth has also lightened, although not as much as the color in the middle of the tooth or near the biting edge of the tooth. This is a common characteristic of any whitening process. Color gradation from the neck of the tooth to the biting edge is also naturally found on teeth which have never been whitened. Another typical response to several weeks of custom appliance whitening treatment. The most significant factor which affects the treatment outcome is patient participation! You must have the commitment to wear the appliances every night over the treatment span in order to reap the full benefits of custom appliance whitening. Fortunately, most people are highly motivated once they have made the decision to proceed with whitening treatment and we expect highly successful results with this whitening process.